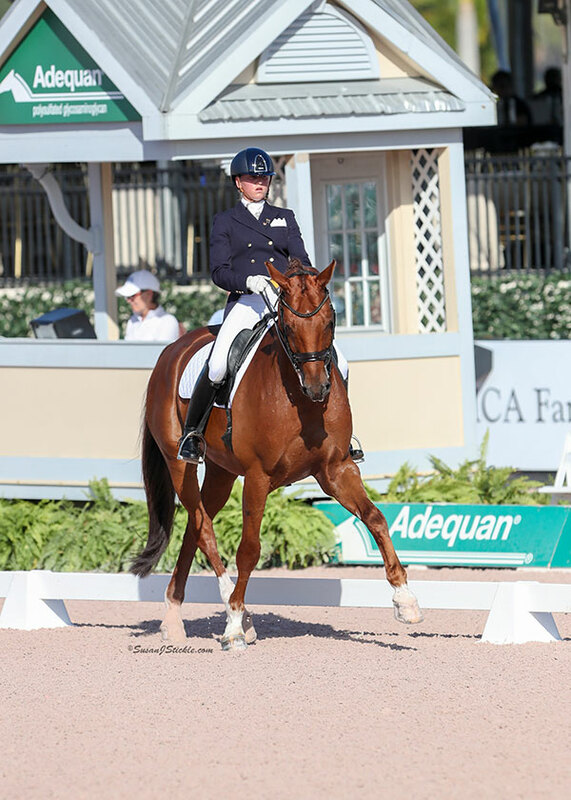 Carier Bergeron started her ride to the top at AGDF 10, held March 15-19, with a third place finish in the CDI-Y FEI Young Rider Team test. Riding Expression (Sibirian Express x Florestan), a 12-year-old Westphalian gelding she purchased last year, she earned a final score of 69.316% on March 17. Carier Bergeron and Expression returned to the ring a day later to capture second in the CDI-Y FEI Young Rider Individual test, this time earning a mark of 68.728% from the judges. They rounded out the competition by scoring 71.650% in the CDI-Y FEI Young Rider Freestyle on March 19 to take third. Later in the month, Carier Bergeron and Expression returned to the AGDF for week 11.The pair kicked off the competition in a big way, landing at the top of the scoreboard on March 22 in the CDI-Y FEI Young Rider Team test with a mark of 72.325%. The next day they put in another impressive performance to take victory in the CDI-Y FEI Young Rider Individual test, scoring 72.061%, before finishing up on March 25 with 71.375% in the CDI-Y FEI Young Rider Freestyle to take the win and claim a hat trick. What is the Red Scarf Athlete of the Month? Each month, a high performance Canadian dressage athlete is named the Red Scarf Equestrian Dressage Athlete of the Month, based on performance and results at FEI dressage competitions within Canada and around the world. As the Equestrian Canada sponsor of the Dressage Athlete of the Month, Red Scarf Equestrian provides the athlete with a generous gift certificate that can be used towards the purchase of elegant equestrian luggage, travel bags, clothing, home decor and accessories that are all made in Canada.